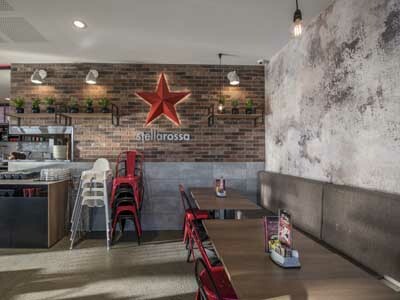 Beaumont Tiles supplied a range of tiles to help the client, What’s On Projects achieve cement and brick finishes at the Stellarossa coffee shop in Yarrabilba, QLD. Raw design features such as exposed brick, cement and timber are teamed with clean, modern finishes to give a chic edge to this urban industrial oasis. The concrete appearance was achieved with Beaumont’s Icon Dove tile while the exposed brick look was created with the Tribeca Old Red Brick. Dynamo Light Stone, a textured porcelain tile from Beaumont was selected for the floor and United white subway tiles flow throughout the store in both satin and gloss finishes. Beaumont tiles were installed in the kitchen and front-of-house areas by the Beaumont Commercial team.